I draw this because borderline sugested to draw some doujinshi from Angel Dust Neo, and this is Marino. I invented how she looks in her combat suit, then draw and paint it. 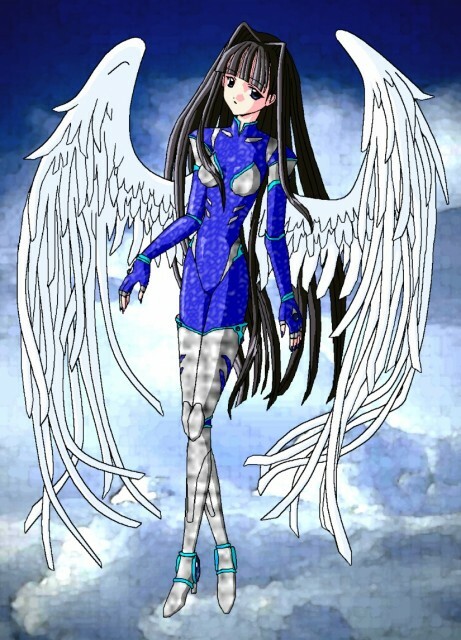 But it take me a lot, because it was dificult to find art from Angel Dust Neo. I hope that all of you like it. Browse Angel Dust Gallery: Recent | Popular. I don't know how faithful this is to Aoi Nanase, but that's not the issue. Congrats on trying to create something original. i think the wing on the right side of the picture should be larger than the one on the left. Also, maybe the wings might look better if they originate around the shoulder blade area in the back... these wings look a bit lower than that... giving a more demonic look. Feathers are so long on the others look in their combat... suites or attire... that it's nearly impossible to have them not come out looking like cloth instead of feathers.... Not sure how to correct this really, because the lines around the edges of the feathers seem to be lighter or thinner than the rest. Good Job on creating an Emulator outfit for Marino. :)! I have to say that it fits her good. Godo job on the drawing! Keep up the good work! the details on her wings are outstanding and you did an amazing job on the colouring.